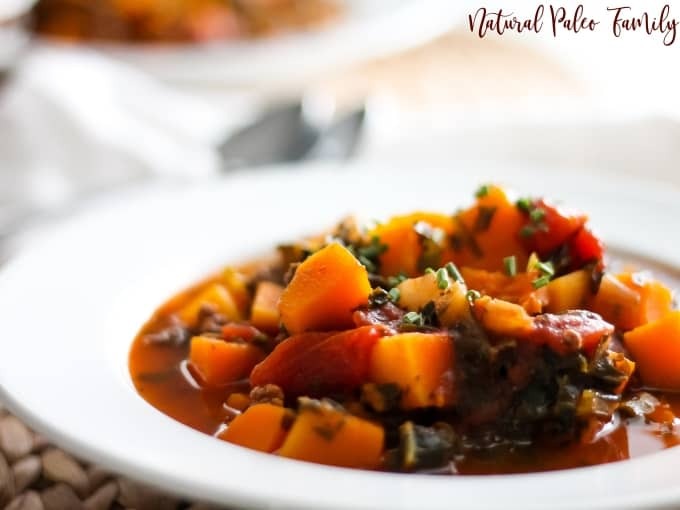 This hearty sweet potato chili is a must-try if you’re looking for a Paleo or Whole30 alternative to your favorite comfort food, and craving a warm dish during these cold months! 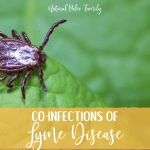 I’ve spent the last four years overcoming my Hashimoto’s diagnosis and figuring out how to beat Lyme disease. So while I’ve been focusing on overhauling my food habits and been eating pretty clean for the most part, I really needed to get strict after the holidays this year. 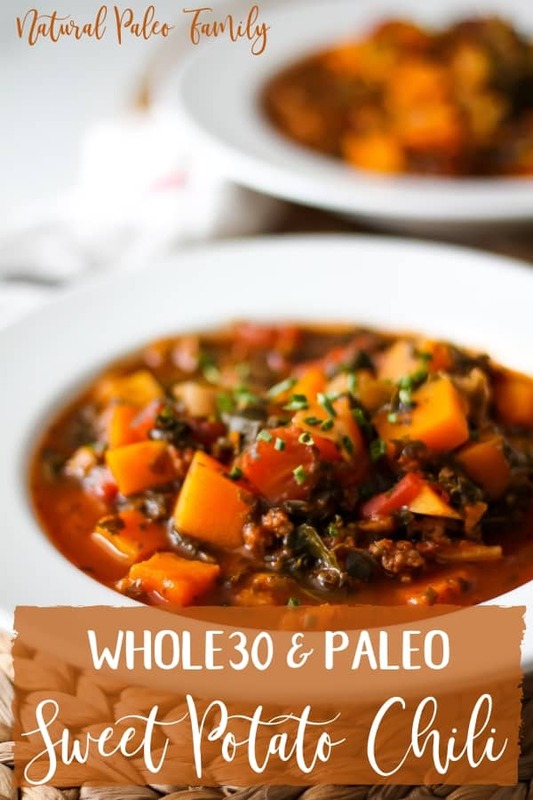 This Whole30 and Paleo sweet potato chili has been perfect for filling our plates and our tummies without filling my days with prep-work and cooking! It’s really healthy, without sacrificing flavor. I always make it if I need a big meal that I’m sure will please our guests, and it hasn’t let me down yet! This sweet potato chili is so simple. It only takes about 15 minutes of prep time, and largely cooks on its own. 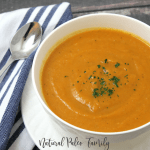 Put it in the Instant pot, set it, and forget it! It’s a family favorite in our house, but we can’t currently eat sweet potatoes since we are on GAPS. I substituted butternut squash for the sweet potatoes and it’s delicious! In the Instant pot, brown the ground beef, onion, and garlic. Once the meat is cooked and the onions are translucent (and smelling delicious), add the chopped sweet potatoes, tomatoes and sauce, frozen spinach, broth, and spices. Stir thoroughly to make sure that the sweet potatoes are fully submerged in broth, and put the lid on the Instant Pot. Make sure the valve is closed, and cook on “Soup” or “Stew” for 7 minutes. After it’s done cooking, you can release the Instant Pot valve and let it come back down to normal pressure. Stir it while it cools down, to make sure that everything is cooked evenly. On the stove, brown beef with the onions and garlic until cooked throughly and onions are translucent. Add the beef and onions/garlic to the slow cooker. Next, add the remaining ingredients to the beef in the crockpot. Stir thoroughly, making sure that the sweet potatoes are submerged. Cook on low for 5-6 hours, or high for 3-4. Be sure to stir every hour or so. This chili would be delicious with either quinoa or rice, if you don’t need it to be paleo. In order to add rice or quinoa, rinse 1 cup of the grain of your choice and add to the Instant Pot at Step 3, prior to cooking. Cook as normal. You can also use cauliflower rice instead of normal rice. If you want to use that, then be sure to add it as the last step, and then just let the heat from the chili warm the cauliflower rice thoroughly. If you don’t have (or don’t like) sweet potatoes, you can use butternut squash or acorn squash. Follow the same directions as with the sweet potato, and enjoy a GAPS friendly chili! Make sure to cut the sweet potato (or butternut squash) into small cubes. If the cubes are too large, they may still be hard on the inside once the Instant Pot is done cooking, and it won’t be as good. Small cubes ensure that it will be cooked evenly. Add a little bit of cayenne if you want a kick! I don’t personally love spicy chili, but my husband does. This seasoning is a favorite of his for when I make this sweet potato chili. Make sure the valve is closed, and cook on "Soup" or "Stew" for 7 minutes. After it's done cooking, you can release the Instant Pot valve and let it come back down to normal pressure. This chili would be delicious with either quinoa or rice, if you don't need it to be paleo. In order to add rice or quinoa, rinse 1 cup of the grain of your choice and add to the Instant Pot at Step 3, prior to cooking. Cook as normal. If you don't have (or don't like) sweet potatoes, you can use butternut squash or acorn squash. Follow the same directions as with the sweet potato, and enjoy a GAPS friendly chili! Make sure to cut the sweet potato (or butternut squash) into small cubes. If the cubes are too large, they may still be hard on the inside once the Instant Pot is done cooking, and it won't be as good. Small cubes ensure that it will be cooked evenly. Add a little bit of cayenne if you want a kick! I don't personally love spicy chili, but my husband does. 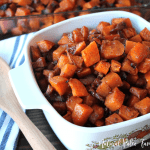 This seasoning is a favorite of his for when I make this sweet potato chili. While you can make this in either the crockpot or Instant Pot, I prefer the Instant Pot way. It’s so much faster, the taste is delicious, and I love how tender everything gets in such a short period of time. The result is perfection! 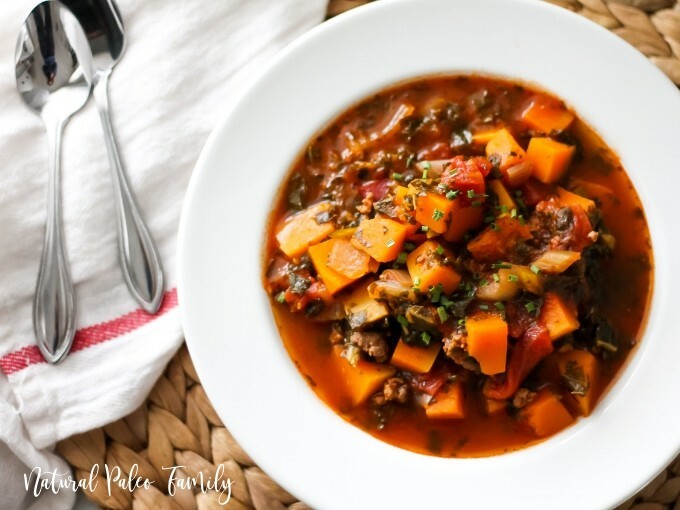 Do you have a favorite Instant pot Whole30 meal? 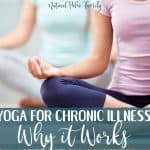 This post was originally published in January 2017. It was updated in January 2019 with new pictures and instructions. It’s so yummy! Hope you get to try it! Can I use fresh spinach and fresh bell peppers instead of frozen? Yes Colleen! I would put the bell peppers in at the beginning, and the spinach with about an hour left ???? When I saw the recipe call for 4 tablespoons of chili powder I thought that was excessive and only used 1 tablespoon. It was still too hot. Next time I make it I will adjust it to less. Thanks for the feedback, Patti! That should be 4 tsp, I must’ve had a typo. Thanks for pointing it out! We do like it a little spicy, so that’s why there’s 4. Definitely adjust it if it’s too hot for you… hope you liked it otherwise! How long would you put this in the crockpot? Sorry- accidentally deleted that part! On the stove, brown beef until cooked through. Add beef and remaining ingredients to crockpot. Stir. Cook on low for 6 hours, or high for 4.